HomeBlogDare to RepairDare to Repair Cafés Return in 2019! Download the flyer and share to help us get the word out! Thanks to new partnerships with Buffalo Promise Neighborhood, Say Yes Buffalo, and BPS Community Schools, a number of events will be happening in Buffalo Public Schools during their Saturday Academies programming. The goal of this new partnership is not only to fix things for free, but also to teach kids technical knowledge and hands-on repair skills. 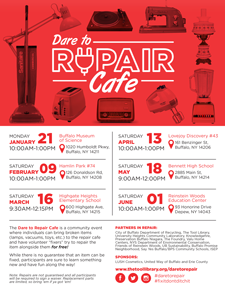 For those unfamiliar with the initiative, the Dare to Repair Café is Buffalo’s take on the global Repair Café movement, which started more than 10 years ago in Amsterdam. Conceived as a way to rethink waste and transform our throw away economy at the local level, the Repair Café model has since spread to more than 50 countries with nearly 47 cafés now active in the US. At each event, Dare to Repair volunteer “fixers” work side-by-side with attendees to repair their items for free, saving them the cost of replacement and teaching them the necessary skills to make similar repairs in the future. The event is meant to reduce the amount of trash entering the waste stream, pass on traditional repair skills and knowledge, and foster community and sustainability. Originally the brainchild of the City of Buffalo Department of Recycling and the Tool Library, the initiative has grown into a broad-based partnership that includes: University Heights Community Laboratory, Knowledgefire, Preservation Buffalo Niagara, The Foundry, Valu Home Centers, NYS Department of Environmental Conservation, Friends of Reinstein Woods, UB Sustainability, Buffalo Promise Neighborhood, Say Yes Buffalo/BPS Community Schools, Interdisciplinary Science and Engineering Partnership (ISEP). The Dare to Repair Café hopes to continue to spread the important message of moving our economy from a linear model based on disposibility to a circular model based on repairability and reuseability. 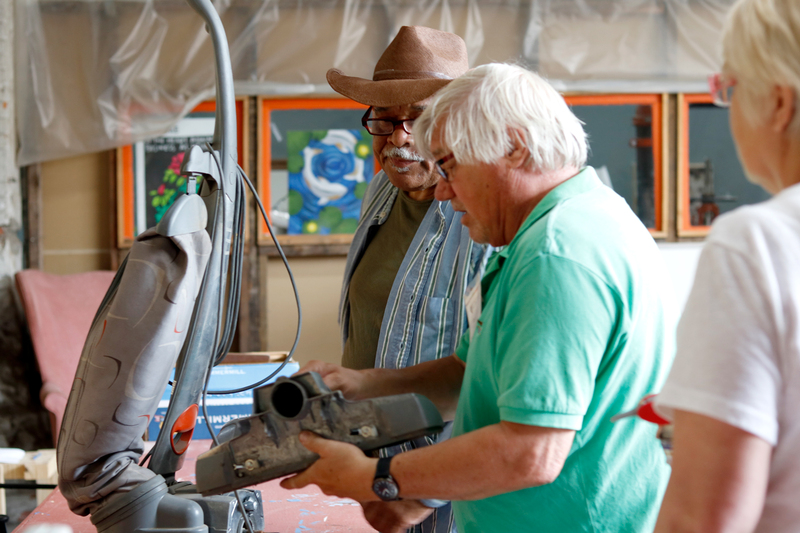 Lead photo: Paul Jones, a Dare to Repair fixer, troubleshoots a vintage vacuum cleaner at an event at The Foundry last summer.